It has been a bit hot here lately. And by a bit, I mean “cook you brain/even the cactus looks PO’d hot”. So when B & I were thinking about what to drink, it had to be something on the lighter side, but as it was evening, we wanted something a with a bit of complexity as well. This leads us to our third of four installments where we try out the winners of Imbibe Magazine’s “Simple 4 Ingredient Cocktails” challenge. So far we have taken the High Noon and The Graduate for a spin and both were impressive. This time we decided to try the Django Reinhardt, a creation of Erick Castro of Polite Provisions in San Diego. The choice of dry vermouth as the main ingredient played off of the citrus is a pretty unique idea. Gently muddle the orange slices in the shaker . Add the remaining ingredients and fill with ice cubes; shake until chilled, about 10 seconds. 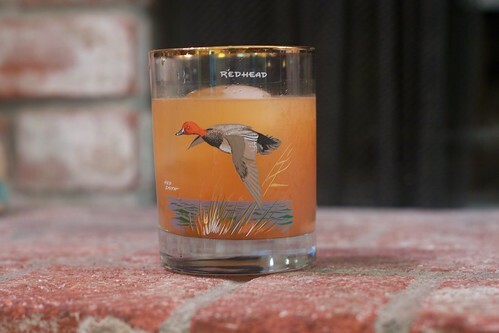 Fine-strain into a rocks glass filled with fresh ice; garnish with a slice of orange. This is an interesting drink. The large amount of aromatic infused wine in the vermouth instead of a hard liquor base leaves the drink a bit lighter than many on this blog. So while always important, the freshness of the vermouth is even more critical for this drink. Also, it’s probably best to make sure the slices of orange are pretty thin or the drink can incline toward the overly sweet. All in all, it’s a very nice, lighter summer evening drink. A fact made even more impressive considering it’s made vermouth and orange juice; two ingredients that would cause lesser bartenders to blanch.